Ironic Soup — and the power of a yes. I worked relentlessly on pestering (I mean encouraging) Amy Newmark and Chicken Soup for the Soul (CSS) brand to publish a book of inspirational stories about the The Healing Power of Recreational Therapy. I’m definitely persistent. I spearheaded a team that sent thousands postcards, emails, and marketing material to Chicken Soup for the Soul. We had a change petition and team meetings. And the CSS brand told me no several times by snail mail and email. They started to sending packages back. I get it. I was bothering them, so I quit pestering (as much). I pretty much leave them alone now. I’ll email about once ever three months to suggest the book again. CSS released a new book! Amy Newmark and the Chicken Soup for the Soul brand released a book titled: The Power of Yes last week (Aug. 14, 2018). The concept of this book is how a “yes,” changed life for the better. And I mean “yes,” they did that. (laugh aloud). I’m typing this with a bit of humor. I’m not “bitter” from their soup. I’ve pre-ordered their 2018 Christmas books for my mother who loves Christmastimes. I can post that here. My mom doesn’t read my blog. Of course, I’ll validate that recreational therapists like you assist in helping people to change their lives for the better. It is okay that Amy and the CSS brand told me “no.” I can handle a no. It often means, not now, or not from you, or something better is coming. I like to think how Oprah Winfrey was fired from her “prestigious” job as a news reporter. She was “demoted” to a position as a talk show host. Of course, the rest is history now. Oprah might be the world’s most famous talk show host ever. I believe I’m a fairly easy-going person and I think a bit humorous too. My path in pursing the book of inspirational stories took me further and on different paths. I met with Jack Canfield (the original co-creator) for the Chicken Soup for the Soul brand twice (once in late 2016 in Chicago) and again in April 2017 in Philadelphia, PA.
Jack, one of my heroes sold the CSS brand. He had written one letter to CSS about my recreational therapy book and CSS still said, “no.” Jack told me to find another publisher. Jack reminded me of how he asked 144 publishers to publish Chicken Soup for the Soul. I’ve changed my question to: What can I do to get a yes? I got to be on a Mastermind team with Patty Aubrey who had typed out the original Chicken Soup for the Soul book. Patty is wonderful. I’ve had the opportunity to go to her house three times. She has helped me so much. I haven’t given up on my goal for getting a book of inspirational stories about recreational therapy put together. I have put it on the back-burner for now as I’m working on several other projects. 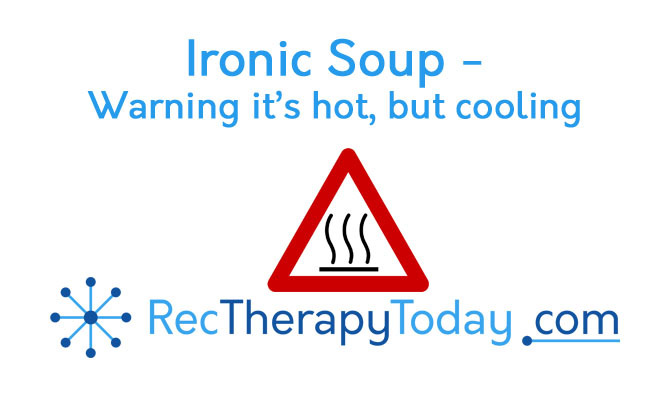 Keep following my blog here at Rec Therapy Today (RTT) to see what I’ll create for you next. I love Chicken Soup for the Soul books, and I think your idea is brilliant. Did they give a reason why they won’t pursue this topic? I know there are oodles of recreational therapists out there with beautiful stories to tell.